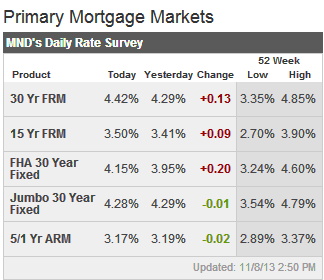 Long-term mortgage rates saw a jump this week following better-than-expected economic reports. Freddie Mac released Thursday the results of its Primary Mortgage Market Survey, putting the average 30-year fixed-rate mortgage (FRM) at a rate of 4.46 percent (0.5 point) for the week ending December 5, up from 4.29 percent last week. A year ago, the 30-year FRM averaged 3.34 percent. The 15-year FRM this week averaged 3.47 percent (0.4 point), up from 3.30 percent previously. Reports were mixed for adjustable rates. The 5-year Treasury-indexed hybrid adjustable-rate mortgage (ARM) averaged 2.99 percent (0.4 point) this week, up from 2.94 percent. The 1-year ARM, meanwhile, averaged 2.59 percent (0.4 point), a slight drop from 2.60 percent. Frank Nothaft, VP and chief economist for Freddie Mac, pinned the increases on encouraging growth in private jobs and new home sales. Bankrate.com’s weekly national survey showed increases all around. According to the site, the 30-year fixed average rose to 4.55 percent this week, a gain of 11 basis points, while the 15-year fixed average increased 15 points to 3.62 percent. The 5/1 ARM was up more modestly, rising 4 basis points to 3.33 percent. via Mortgage Rates See Sharp Increases. The real estate industry sometimes uses language that appears at first glance to be clear, but do you as a consumer know what some terms really mean? At first glance, the words client and customer seem pretty clear-cut, but they mean completely different things to a REALTOR®. It also means a tremendous difference in how seriously you are taken as a buyer. Clients and customers receive vastly different types and levels of service. After you read why, you’ll know absolutely whether you want to be one or the other. First, let’s start with a little history. Realtors have always worked with home sellers to list their homes for sale on the market. Along with this service comes the responsibility to advertise the homes, network with other Realtors to find a buyer, negotiate the sales contract and guide the sellers to successful closings. Because of the time and expenses incurred by the agent and broker which will not be reimbursed until the closing of the home, sellers have always been required to sign a listing contract. This contract enables the agent/broker enough time to properly market the property, find a buyer, negotiate a contract and get the property to closing within the time frame allowed. It also protects the agent from home owners who wish to use services without compensating the professional. The real benefit, however, is for the home owner. Once the home owner has signed the contract, the agent/broker has the fiduciary responsibility to get the highest price possible for the home and to protect the seller’s interests above all else. The agent also must follow state-mandated regulations as to ethics and legalities that are enforceable by state councils in conjunction with the agent’s local Realtor association. In other words, the contract is legally binding, with the agent’s reputation at stake. Now that a contract has been signed, the home owner is the client of the agent/broker, and enjoys the full privileges of a close, working relationship. Buyers have historically worked with agents, too, but it wasn’t until fairly recently that they have been asked to sign buyer’s representation agreements. This is a change that has come about because of two reasons: abuse to buyer’s agents and increased consumer awareness. Without a contract, the buyer’s agent was particularly vulnerable to working without getting paid. Too often, buyers would ask them to show them house after house, and then buy from another agent. One favorite buyer trick is to attend open houses without their agent and tell the listing agent they aren’t working with anyone. Buyers mistakenly believe that they are learning about more homes without an agent at their side, or that they may possibly get a better deal. The truth is – they don’t. They usually pay more for the home than they have to when they buy from the listing agent directly. The listing agent has a contract to get the most for the seller, remember? Then consumer awareness dawned. Buyers began to realize that whoever represented them at the closing table was on the side of the seller, not their side. They realized that they deserved to have a true advocate, and the buyer’s agent was born. Good agents don’t want to work for free, so the buyer’s representation agreement was created. Again, it is a protection for the agents, but it generates much more benefit for the buyer. The main advantage is that an agreement releases the agent from a fiduciary responsibility to the seller and enables the agent to pursue the buyer’s goals without any othe agenda. It’s as valid a contract as that between the seller and listing agent. Once the contract is signed, the agent goes into motion searching the MLS for homes, and seeking homes through other avenues – foreclosures, FSBOs, and REOs. At negotiations, the contracted buyer’s agent becomes a bulldog for the buyer, unrestricted by responsibility to the seller or seller’s agent. Buyers under contract are more empowered to make demands, get a better price and better terms of sale. Despite these advantages, some buyers are still reluctant to sign a representation agreement. They don’t want to be “tied down” or they foolishly think that getting several agents to work with them will get them a better home or deal. That’s a strategy that backfires. Part of the strength of the industry is the agent communication network. A buyer working several agents becomes a joke and is not taken seriously by anyone. Without a contract, the buyer is clearly not a client. He/She is a customer. 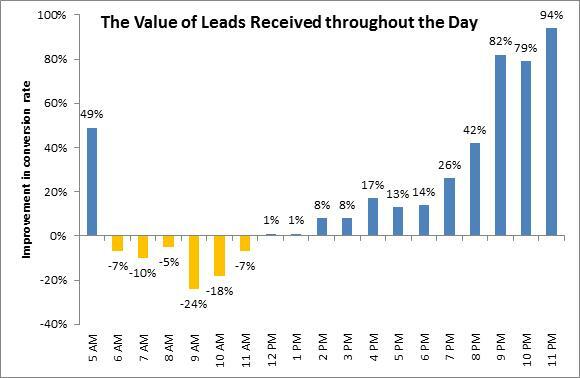 If you think being a customer is as important as being a client, look at what happens when a good listing comes on the market. Agents tell each other about listings first, many times before they are even entered into the MLS. 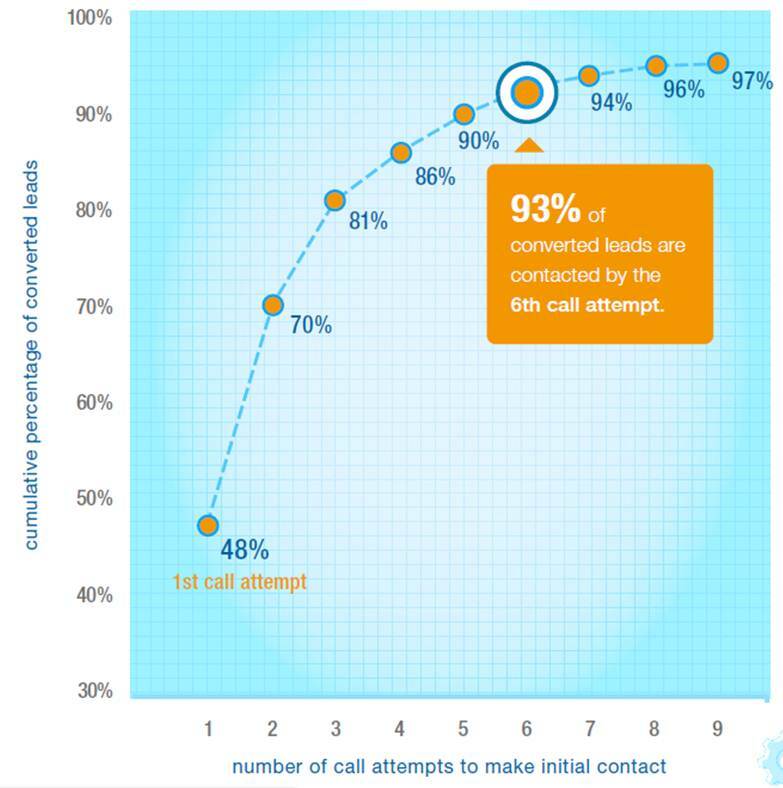 In a hot market, which buyers do you think agents will call to grab a desirable property – the uncommitted, disloyal buyer (customer) or the contracted buyer (client?) What would you do if your livelihood depended on picking between such buyers? If you’ve ever driven a favorite neighborhood and seen a Sold sign stuck in the yard of a desirable property that you didn’t even know was for sale, now you know why your agent didn’t pick you – because you didn’t pick him or her. A contract makes a difference in other ways. For example, there are things the seller may not want disclosed to the buyer such as their urgency to sell, which could compromise their bargaining position. An agent who then discloses this information is in ethical violation and can be brought before the state review board on charges. Some offenses are serious enough to have licensure to practice revoked. But the buyer has no such protections without a contract. Anything you say to an uncontracted agent may be passed along to the seller. Why? Because, in most states, any agent who works for the buyer without a contract automatically becomes a sub-agent for the listing agent, and is therefore working on behalf of the seller. Surprised? It’s all spelled out – in the listing contract and in the buyer’s representation agreement. A contract makes the difference in whether you are a customer or a client in the real estate transaction. Which do you want to be? The Rental Market SPV: Bring out the memories of CDOs and Special Purpose Vehicles. The start of selling rental income through Wall Street. The number of Americans renting has grown since the recession hit. The nation has shifted from one where everyone should own to one where many should rent (and rent from a large hedge fund or Wall Street investor). 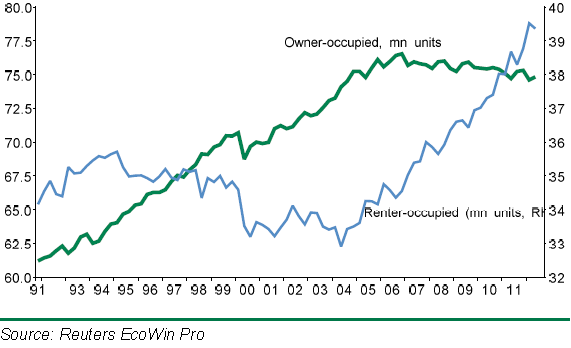 We have become a renter nation. The demand from investors buying through large financial institutions for the purpose of renting out single-family homes has never reached this manic level in history. Even last month, roughly 30 percent of all home purchases continued to go to the investor crowd. So it should be no surprise that the first-ever bond backed by US home-rental cash flows is now being backed by Wall Street. This is a $500 million deal for Blackstone and is being structured by Deutsche Bank, Credit Suisse and JP Morgan. The deal is listed under “Invitation Homes 2013-SFR1” bringing back the days of the CDOs and complicated derivative structures that imploded on the balance sheets of many banks. These REO-to-rental structures seem good on paper but anyone involved in the rental business knows how fickle these markets can become. Plus, should the economy ease up again what do you think will happen to those rental cash flows? Also, some of these hedge funds have focused all their attention in areas like Nevada and Arizona that fully depend on the housing market going up and up and for these areas, investors have been buying upwards of 50 percent of supply. The recession caused the foreclosures of more than 5 million households. Since 2009, roughly one third of all home buying has gone to investors. So this has been a shift from overburdened households to bigmoney investors, many that got in with some extremely great deals courtesy of favorable bank financing. The Fed made this bed; force rates to incredibly low rates to make saving a horrible option and chase money into speculative realms. In California last year we had 94,311 homes available for rent. Today, it has dropped to 58,157. At least for California where the middle class is visibly struggling and affordable housing is out of reach for most families, renting has become a viable option (the only option for many). As we are seeing with the prices for homes over the last year a very constrained supply is going to push prices up especially with hungry investors diving in. The special purpose vehicles (SPV) for rental cash flows is probably the golden prize of many big investors. Many appear to be making that final hurrah like those dumping CDOs in 2006 and 2007. 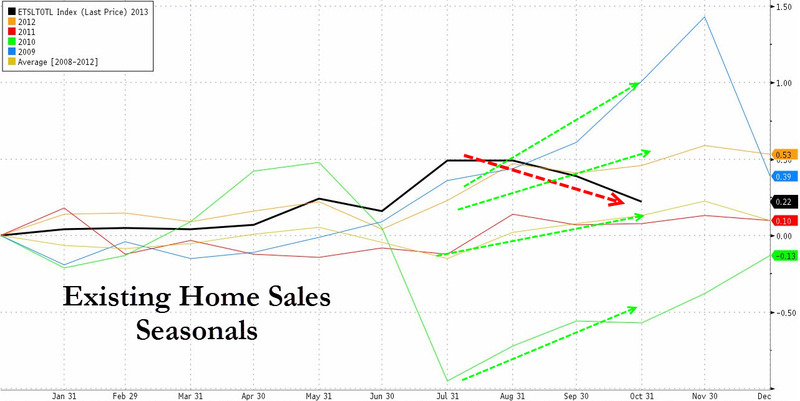 For the first time since 2009 we are seeing a drop between the July and October sales numbers for existing home sales. These are always seasonal, or used to be at least, but over the last few years the demand trend has been bucked. This year, there is definitely something that is shifting. Where is the demand coming from? The investor demand that largely avoids mortgages has alternative sources of financing. Yet for the public stretched with weak household incomes everything depends on low interest rates and other gimmicks that lower the monthly payment. This is why we have seen theresurgence of ARMs and FHA insured loans are still a popular option for many cash strapped buyers seeking to purchase a home. It is also a reason why a modest move of 100 bps with rates still in the low 4% range has hit the market hard (even though these are fantastic rates). Typically the fall and winter are slower selling seasons but as you see from the previous chart of existing home sales, this is a trend reversal from the last five years. The fact that we are now seeing rental SPV is very reminiscent of the CDO days of the housing market. Many renters are on a razor’s edge so this is a very sensitive market if a recession were to take place. How will these SPV respond? This is an untested market and with prices softening and sales slowing down, the yields may not be so lucrative especially with the mortgage rates soaring 100 bps in 2013 in spite of the Fed basically owning 12 percentof the mortgage market via QE. 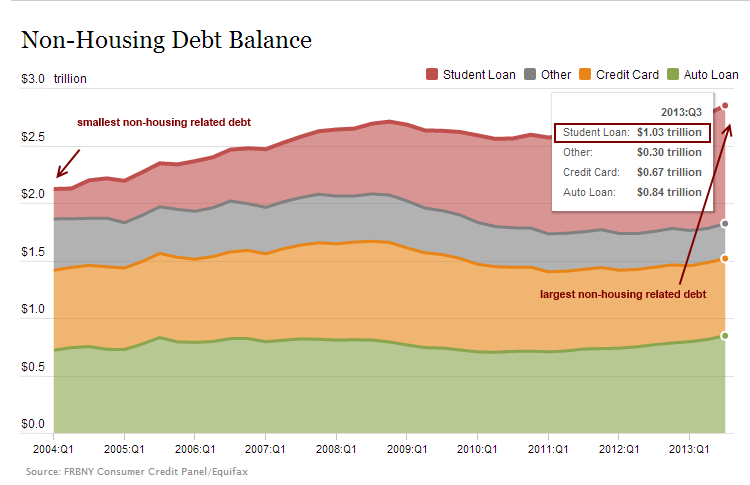 Young and priced out of the US housing market: Mortgage debt traded for student debt. 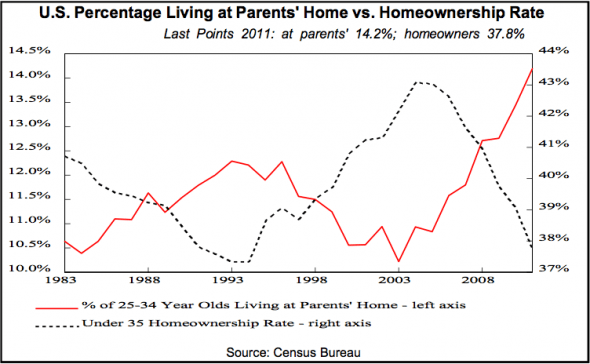 The dramatic fall in homeownership for those 40 and younger. The New York Fed issues a quarterly report on credit conditions in the US. The recent report highlights a continuing trend showing young Americans are going deep into debt to pay for their expensive college educations. In fact, student debt is now the largest non-mortgage related debt in the country. This problem reflects a big issue for young potential home buyers. It also helps to explain why the homeownership rate for young households continues to fall and why many young adults are living at home. Many are coming out of college with student debt levels of $50,000 or even $100,000 and job opportunities are not justifying the costs for many graduates. Yet given our lack of good pay blue collar work, going this road is perceived as viable given that non-college educated Americans have very limited opportunities. Given the recent rise in home prices and lack of wage growth especially for the young, it is likely that the homeownership rate will continue to fall for this group. In places like California many parents are finding it necessary to gift or provide down payment assistance for their children to buy even a starter home. This assistance isn’t a few thousand dollars but tens of thousands or even hundreds of thousands of dollars. The young are being priced out of buying a home. This is a startling reversal. 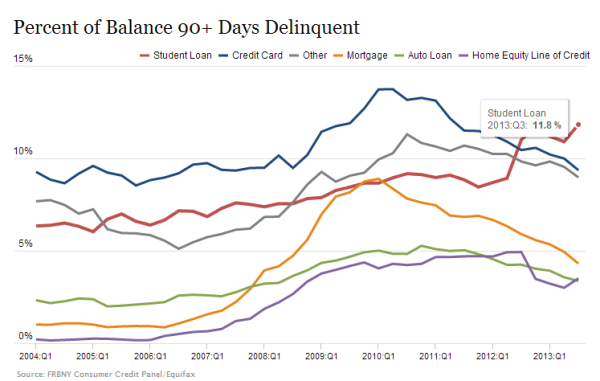 Student debt is now the most delinquent debt class. 11.8 percent of all student debt is now 90+ days past due. As we just noted, this is now the biggest non-mortgage related debt sector in the US. Of course this is going to be an impact on the ability for young households to buy. Many young Americans simply cannot buy and given the current short supply of inventory, rising costs, and massive investor demand many have very little chance of buying a home. No need to speculate on this, we need only look at the hard numbers. If you look at the data carefully, you notice a slight move up during the bubble years of 2005 to 2007, however this was built on NINJA loans and ignoring income. That was really the only thing that allowed this group to gain access to homeownership. However, this has quickly reversed given the weak employment market for the young and the massive amount of student debt being carried by this group. As you would expect a large number of younger Americans are living at home. “(USA Today) Loans with down payments between 5% and 10% accounted for almost a fifth of the conventional loan offers that lenders made on the LendingTree online exchange in the first quarter, according to LendingTree. In other words, the young have a hard time saving given their heavy debts and lower incomes so lenders are just dropping the amount needed to buy. In SoCal FHA insured loans with a 3.5 percent down payment are still 20 percent of the market. So you have the large investors buying with all-cash and then you have regular households stretching their budgets to get in. It is no surprise then that affordability has fallen dramatically even in the last year. The answer to this as it was during the last bubble is simply to increase the amount of debt shouldered by households. This continues to work so long as prices keep going up. Do you know of anyone that is young (35 and younger) and buying in this current market? It would be interesting to hear your story in the comments and information since many are probably in similar situations. Young and priced out of the US housing market: Mortgage debt traded for student debt. The dramatic fall in homeownership for those 40 and younger. 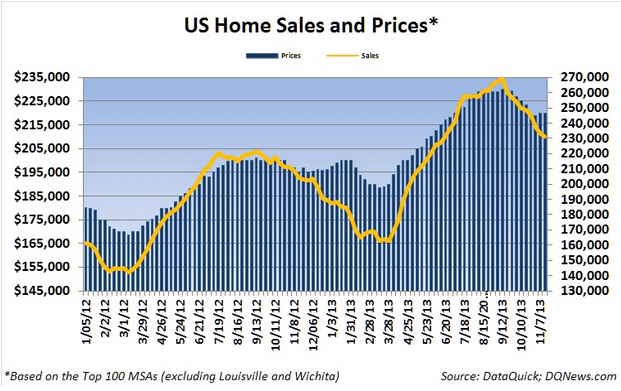 » Dr. Housing Bubble Blog. The Unaffordable Golden State: Only 1/3 Californians can afford a home. How a minor jump in interest rates and a big rise in prices has thrown off affordability. Price reductions at highest level in 3 years. The housing market is definitely softening. Sales are slowing down, price reductions are increasing, and affordability has decreased dramatically because of spiking interest rates. The problem with relying with artificial stimulus is that the market becomes conditioned to easy money. A recent survey found that only 1 out of 3 Californians had the means to purchase a home, down from 49 percent one year ago. The big change has come from spiking prices, weak wage growth, and of course a 100 basis point increase in interest rates. So it should come as no surprise that inventory is up and more sellers are facing the need to reduce prices. 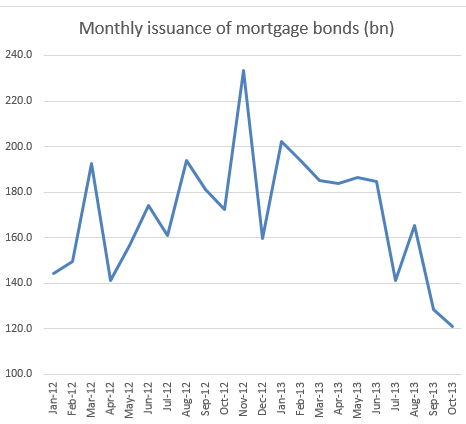 This QE experiment has ‘worked’ but now bigger action is needed to keep the gig going. The Fed owns the mortgage market but with a job report that appears to be solid on the surface, the Fed is now having more pressure to taper. Of course looking at the evidence there will be no taper but perception is the name of the game. One thing is certain and that is, it looks like a tipping point is here. 1 in 4 sellers are now forced to reduce their asking price (the highest in three years). This is a dramatic reversal when only early this year, sellers were getting nearly everything they wanted. Agents were recommending contingent free offers and bids over asking. You may have even had the recommendation to provide a personalized PowerPoint on the awesomeness of your family. Today, the market is different. Very different. Of course, tipping points don’t happen overnight. Since the summer mortgage rates rose by 100 basis points. The Fed has made a big bet on low rates and even with $85 billion a month in MBS buying rates and a balance sheet of nearly $4 trillion rates still went up. In 2007 similar trends hit before prices started softening: more price reductions, more inventory, and shifting buyer sentiment. A California household to maintain the affordability of last year would have needed a $24,000 increase in household income just to purchase the median priced home (and this assumes they have a 20 percent down payment of close to $100,000). Even professional households making $100,000 a year have a tough time saving $100,000 because they end up blowing most of their money on rent, cars, and all other sorts of gimmicks that are popular in California. This is why everyone goes bananas when they even mention requiring a 10 percent down payment (when 20 percent was typical a generation ago). This chart only goes out to 2011 but it is useful for historical reference. 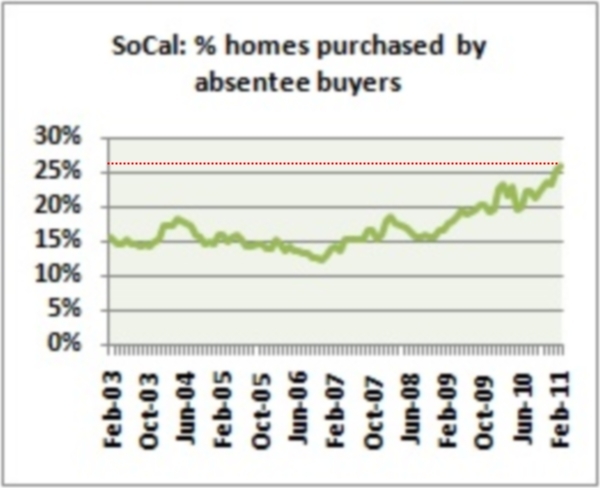 Absentee buying peaked at 32 percent early this year. Last month it was at 26 percent for SoCal so it is certainly moving lower but still incredibly high. A good portion of this market was buying because prices were going up. Like a Catch-22, will there be interest if prices are moving lower? Cash buyers have been the wild card since 2009. With higher rates and a blistering stock market, hot money may not be so interested in real estate especially if it is harder to squeak out gains. The fact that only 1/3 Californians can afford a home tells you an adjustment is on the way. To what extent? We will shortly find out. The Unaffordable Golden State: Only 1/3 Californians can afford a home. How a minor jump in interest rates and a big rise in prices has thrown off affordability. 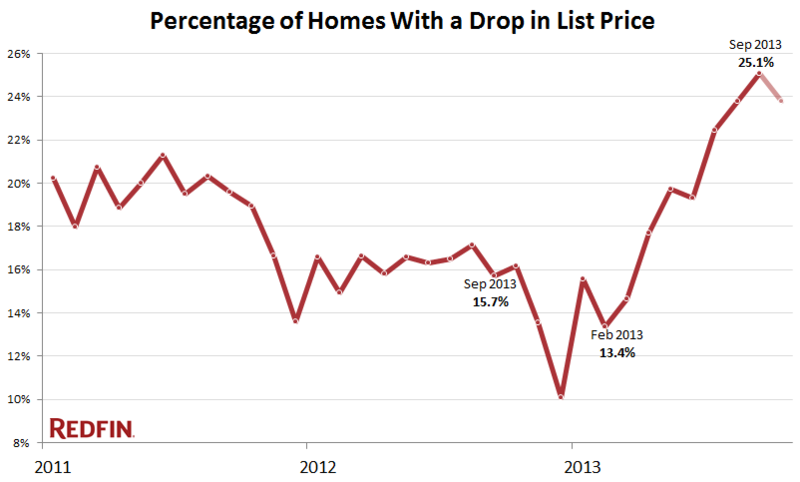 Price reductions at highest level in 3 years. » Dr. Housing Bubble Blog. National home prices were up 10.1 percent year-over-year in the second quarter, but price appreciation is expected to fall out of the double-digits, reaching 5.4 percent by the beginning of next year, according to the CoreLogic Case-Shiller Home Price Indexes. Home price appreciation will continue to occur but will drop off even further moving forward, CoreLogic says. The company’s national index predicts prices will rise 3.4 percent over the next five years. “Combined with increased housing construction, expected increases in existing inventories should restrain price appreciation even if demand remains strong,” said David Stiff, principal economist for CoreLogic Case-Shiller. Currently, prices are rising in almost 90 percent of the nation’s metro areas, according to Stiff. He also points out that prices are rising in all of the nation’s metros where population is more than 1 million. “The strongest growth continues to be recorded in cities that were at the center of the housing bubble, but investor demand in those markets appears to be waning, meaning rapid rates of price appreciation are likely unsustainable,” Stiff said. metros with the greatest annual price appreciation in the second quarter were in California. 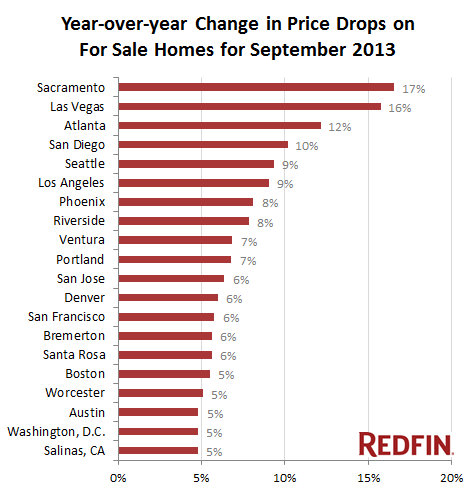 Sacramento, California, experienced the greatest price growth—25.9 percent. Las Vegas took the No. 2 spot with prices rising 24.7 percent over the year in the second quarter. The three California markets to fill out the top five list were Oakland (23.7 percent), San Jose (21.9 percent), and Los Angeles (20.3 percent). At the other end of the spectrum, four of the five metros with the smallest price appreciation are located in the Northeast. Honolulu, Hawaii, and Edison, New Jersey, posted the smallest annual price gains in the second quarter—both at 1.1 percent. They were followed by Hartford, Connecticut (1.3 percent); Long Island (1.9 percent); and Newark, New Jersey (2 percent). Looking forward, CoreLogic Case-Shiller analysts expect a shift in the lineup over the next year. Only two markets are expected to post double-digit gains—Oakland, California (11.1 percent), and Baltimore (10.8 percent). Other markets with price gains anticipated in the top five through the second quarter of 2014 include Tuscon, Arizona (9.5 percent); Hartford, Connecticut (9.1 percent); and Santa Ana, California (8.8 percent). Metros expected to post the smallest price gains over the next year are Miami (1.5 percent); Warren, Michigan (1.9 percent); Nashville (2 percent); Fort Lauderdale, Florida (2.2 percent); and Houston (2.7 percent). CoreLogic notes first-time and trade-up buyers are starting to increase their roles in the market, albeit slowly, while investor demand is waning as fewer distressed homes are listed for sale. via Analysts Say Double-Digit Appreciation Will Come to an End by 2014. The house broken American: Many Americans believe they will work until they die and the only asset many have is their home. Americans for the most part are bad at saving money. In fact, the entire credit boom and bust was largely fueled by people and banks living way beyond their means. Even after the recent boom in the stock market and housing market, many Americans are not in a better financial position. The problem with housing is that this is like having golden handcuffs. You will likely only unlock the wealth when you sell it. As we have discussed many are simply reluctant to sell. So in essence, the wealth is locked away. To sell a home also costs money and real estate for the most part is illiquid. And since the recession ended a large portion of home purchases have gone to investors. Never in the history of the US have we seen so many large institutions dive into the housing market in aspiration of being a landlord. Recent surveys show that many Americans plan on working until they end up in their grave. But what about the boom in housing? Unfortunately many are locked in a granite countertop laden sarcophagus. 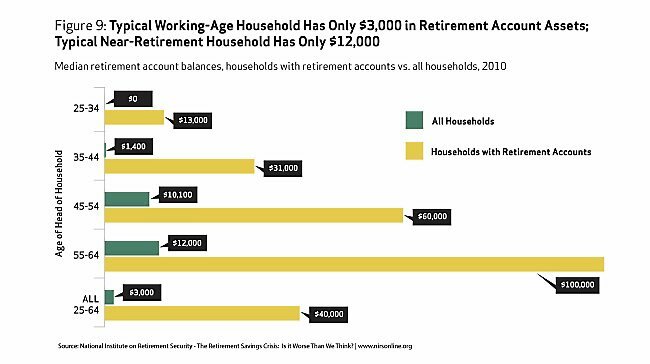 Social Security was never designed to be the cornerstone of a long-term retirement plan for Americans. It was supposed to be one part of a “three legged stool” of retirement that included savings, pensions/work based retirement income, and finally Social Security. Well look at the chart above. The vast majority of Americans are not approaching this anywhere close to the three legged stool approach. This is a one leg chair and Social Security is the foundation. When Americans were living in homes and having mortgage burning parties this made sense but now we have people rarely paying off their homes. Where is the income going to come from in retirement? And with the homeownership rate plunging, many will be paying rent in their older years as well. And don’t think that by simply owning your home that you get away with no costs. You still pay insurance, taxes, and maintenance costs. 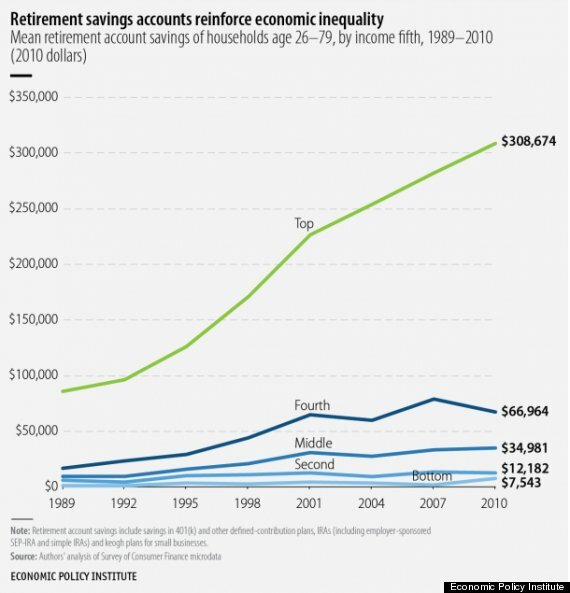 Americans have much less saved up than you think. “(Forbes) Forget pushing retirement off a few years. A growing number of Americans believe they’ll be working until death. An alarming 37% of middle class Americans believe they’ll work until they’re too sick or until they die. And this is for middle class Americans. This isn’t looking at lower income Americans that presumably already know that they won’t retire and will largely be dependent on Social Security if they are lucky enough to make the cut. 37 percent of middle class Americans believe they will work until they kick the bucket. Let us not even discuss the situation of younger Americans looking to buy real estate and have mountains of student debt to contend with. This is why a massive increase in real estate values driven by speculation and artificially low rates rarely does much for the underlying households in the economy. Say you have a $200,000 home and now the home is worth $250,000. Okay. Are you going to downsize? Unlikely. You want a bigger home in a better neighborhood. Well guess what? Homes in that area went up as well. In this market, a good agent is going to end up costing 5 to 6 percent (split among two or one agent). After that is done, you probably have enough for a down payment but you just reset and now have a new mortgage bill that is likely at 30-years again. This is common for most Americans. The typical holding period of a US household is 7 years before they move from their current home. Mortgage burning parties are as rare as flapper clothing in a hip-hop club. This big gain is going to banks and large investors. Even the household that has seen their real estate go up will only benefit if they downsize and that may mean leaving a high cost state (and looking at available data most are going to keep those golden handcuffs on and eat cat food before they sell and “down grade” their standard of living based on zip code). Naïve folks think that “well if the Fed is making rates low, then don’t all people have the same advantage?” Of course not. We are talking about billion dollar hedge funds here that trade in bonds and derivatives. The 30-year mortgage is largely for the average Jane and Joe that can’t contend in this market. We’re talking about negative rates on Treasuries that have forced these banks to ignore rates lower than inflation and go after rental property. Why else would Wall Street be interested in rental real estate? For decades being a “landlord” was seen as beneath them. 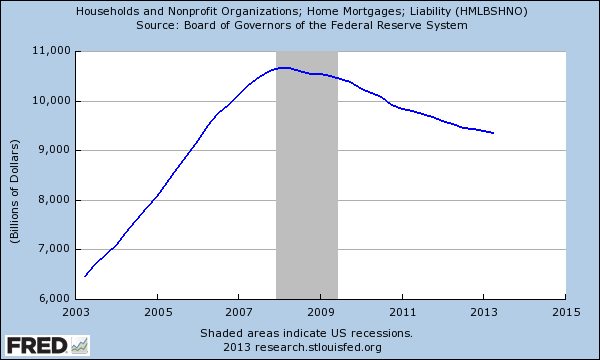 Yet this is what happens when the Fed is quickly expanding their balance sheet to $4 trillion. This formula is working for a very small portion of our nation. This is simply a fact. It is also a big reason as to why the US is becoming a larger renting nation. In many prime locations hot money is accessible to not only US investors but the world. It is hilarious to hear some “loyalist” talk about how much they love their area as if they will only sell to “Americans” but will sell their property to whoever comes in with the biggest bucks. This is part of a global market. If you think the Fed is looking out for the regular US household you have something coming to you. The facts show a very different reality. Those surveys we mentioned where most are going to rely on Social Security and how many are going to work into their graves were conducted recently. That is, these were done in year 4 of the recovery. Many of the jobs that have come after the recession ended in the summer of 2009 have been lower paying jobs. Certainly not enough to support a mortgage in prime locations. Many Americans are house broke. Some are so broke that they have lost their homes to foreclosure (over 5,000,000 and many are still losing homes) but many of these homes are going into the hands of banks. The little inventory out there is trading hands in a very tightly controlled range. Supply is restricted and thanks to accounting rules being bent to the will of the banks, the win is very clear for this group. But looking at other metrics of “wealth” most Americans continue to lose out even with this boom in housing and major rally in stocks. Frankly, most don’t even have enough to purchase a seat at the current inflated table. That flood of homes is unlikely to come because those golden hand cuffs are too enticing to take off. via The house broken American: Many Americans believe they will work until they die and the only asset many have is their home. 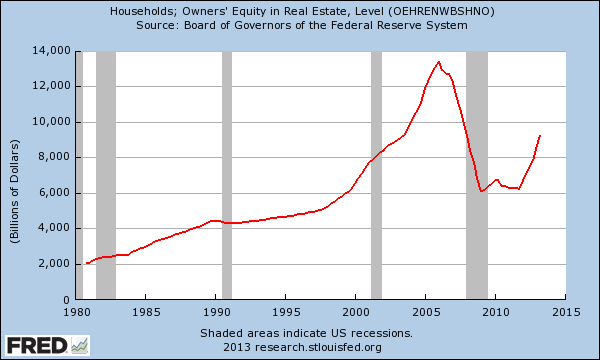 » Dr. Housing Bubble Blog. While maintaining that tight credit conditions and rapid price gains present the greatest threats to the housing recovery, Capital Economics is ready to acknowledge that rising mortgage rates may provide more drag than the firm’s analysts first thought. Tracking mortgage applications (as reported by the Mortgage Bankers Association) from May through September, Capital Economics determined that refinancing activity has taken the biggest hit from the 120-basis point climb in rates with a decline of 70 percent. While the decrease in refinance activity isn’t necessarily reflective of changes in housing market demand, the 17 percent drop in purchase applications over the same period is another story. Tracking sales, Diggle noted numbers were up initially—an expected result as buyers rushed to avoid further hikes—and then down as the pipeline cleared. The most recent data has been more encouraging, though he says those improvements have largely been driven by investors and cash buyers, groups that are immune to higher mortgage interest rates. There is some good news, though. Heightened rates will raise lenders’ return on new loans, helping to fill the gap left by the decline in refinancing and potentially leading to looser credit conditions. “The bottom line is that, three years after activity began picking up and two years into the upturn in house prices, the US housing recovery still faces a number of hurdles,” Diggle concluded. “But to our minds, tight credit conditions, an over-reliance on investment buyers and overly-rapid price gains are all potentially more serious challenges than higher mortgage interest rates. WASHINGTON — The government shutdown and the debt limit have dominated the headlines, but a behind-the-scenes fight over federal mortgage policy has been brewing and it could affect your choices the next time you apply for a home loan. The issue concerns differing rules for different types of mortgage sources. Some mortgage brokerage firms have begun advertising that they offer substantial credits to their customers — often in the $2,000 to $5,000 range per loan but sometimes more than $10,000 — that can be used to defray borrowers’ closing costs. A survey of 164 member firms of the National Association of Mortgage Brokers found that these companies provided more than $69 million in closing-cost credits to clients last year, and are on track to pay out the same or more this year. The group estimates that brokers nationwide rebated upward of $2 billion in 2012. To illustrate: Charles W. Berryman, a departmental chairman at Louisiana State University, closed on a $295,900 mortgage to purchase a home earlier this year. It carried a 3 percent fixed rate for 15 years. Essential Mortgage Co., a large brokerage firm in his area, credited him $3,500 to defray his closing costs. In an interview, Berryman said he had shopped at two competing banks before making his choice. They offered the same attractive 3 percent fixed rate, he said, but no credits. The availability and size of the closing-cost money sealed the deal for him, he said. Plus “it really surprised me,” he added, that one mortgage company could offer such a sweetener while competitors apparently would not or could not. Though no one explained it to him at the time, there was an important reason for the difference. The brokerage firm, Essential Mortgage, was required by federal rules to rebate the money to Berryman. The two competing banks were not. This is because under regulations issued by the Federal Reserve, brokers — who do not lend their own money but can shop among multiple creditors on behalf of borrowers — must disclose all their fees upfront to applicants. They are not permitted to earn any more than the disclosed amounts even if the funding source they choose for a buyer at a specific interest rate will pay them a premium for the loan. When brokers do receive premiums, the extra money must be credited to the borrower. The rules are an outgrowth of abuses during the mortgage boom years, when some brokers steered unsuspecting customers to higher-cost loans in order to fatten fees for themselves. Banks who lend their own money, by contrast, are under no such requirements on premiums. They have the option to offer an applicant a credit — or not — in connection with a given interest rate. In Berryman’s case, for example, the two banks he shopped quoted identical 3 percent rates even though they may have had the flexibility to sweeten the pot with a closing-cost credit. Like most mortgage customers, Berryman was not aware that they might have some flexibility, and never asked. The brokerage firm that he ultimately selected, on the other hand, actively advertises its credits and makes them a selling point with potential clients. So where’s the controversy and what should mortgage shoppers do with this information? Here’s the issue: Brokers complain that they are treated unequally under current rules —they are forced to rebate money, thereby limiting their potential income on transactions, while competitors are not. Plus they worry that new “qualified mortgage” rules scheduled to take effect in January that set a limit on total allowable fees in home loans will only make matters worse. They have protested to federal regulators and are pushing for congressional legislation that would change the rules, but so far have been unsuccessful. What should you as a mortgage applicant take away from all this? Most important, be aware that when you shop among competing banks and mortgage companies, you shouldn’t focus solely on interest rate. Ask about the possibility of credits toward closing costs. If a lender is quoting you the “posted” rate at the time of your inquiry, there may be credits toward closing expenses available at that rate or at another rate. Review the full range of rate scenarios, fees, monthly payments and cash needed to close with the loan officer. Like Professor Berryman, you just might be surprised.